Everyone thinks about flying like a bird in the sky sometime in their life. People have been captivated by flying like birds since the beginning of human imagination. Perhaps it began with the invention of paper by the Chinese. Leonard Da Vinci is reported to have used parchment paper in the model of the study of a helicopter and the Montgovier brothers of France used paper for making hot air balloons in the 1700s. But perhaps it was the Wright brothers use of paper planes as research that ignited the imagination most with their first successful flight in 1903. Engineers in several countries used paper and paper products to study wing shape and aeronautical designs during WWI and WWII. During the second period, paper airplane designs by an Englishman, Wallis Rigby were printed in the comic section of some US newspapers on Sunday. His designs offered a tab and slot system of cut and construction. In the forties, the cereal company, General Mills, offered paper airplane models of fighter airplanes for cereal box tops and a nickel! Making paper airplanes is fun! All you need is a piece of paper and your imagination to fold the paper into a form that can be whipped into the air. 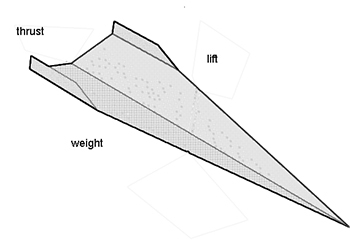 When flying a paper airplane, you must consider the forces of lift, drag and weight. Lift is needed to move the glider into the air against its own weight. (Think about jumping up in the air…. and then coming down; lift is the force of throwing you airplane into the air). The motion of the glider through the air generates drag or a friction or pull. 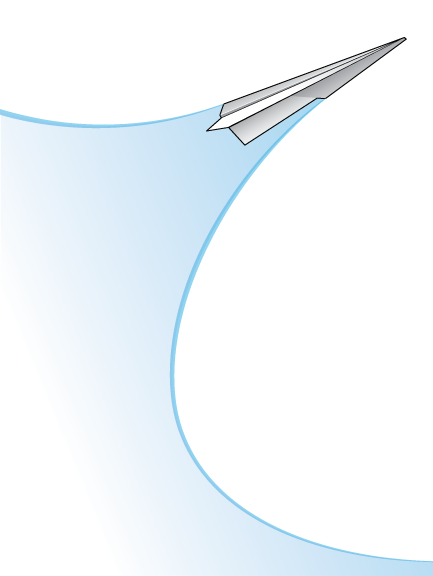 Unless a glider catches an air current such as an updraft, the glider will slow down until it can no longer generate enough lift to oppose the weight, and falls to earth. 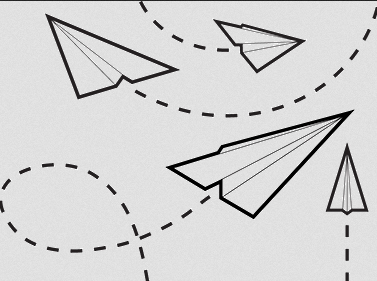 Draw three schemes for a paper glider and notate air direction and movement. Label lift and drag. Prepare to make paper airplanes! Create, name and decorate three different paper airplanes using only your hands and single sheets of paper. Starting at the same starting point, throw your paper airplane into flight. Measure the time and the distance your plane stays afloat. Using a calculator, average the time and the distance of this plane. Measure the average of three flights each and create a bar chart that shows the distance and a bar chart that shows the average time for each airplane. Which airplane flew the longest distance? Which airplane stayed a loft the longest? Why? This time, work with different types and sizes of papers. Consider using heavier paper. Make larger and smaller planes with more complex folds. Research different types of folds, shapes of papers and wing forms. 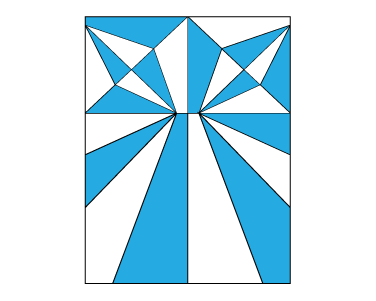 Draw the fold pattern and then copy it onto a second sheet. You will have a record of your folds and a paper plane to compare. Learn from each plane’s flight performance to design the next one. Now that you have experience flying paper airplanes, it is time to try a series of specific challenges. This time, you are going to fold a rectangular piece of paper to keep the plane aloft as long as possible. What type of form do you think works the best for this situation? Hint: Try a boxier, trapezoidal shape with lots of wing area. Make five tests. Make a chart and record the shape and record the time afloat! Check the Guinness World Record for longest flying paper airplanes. How close did you get? 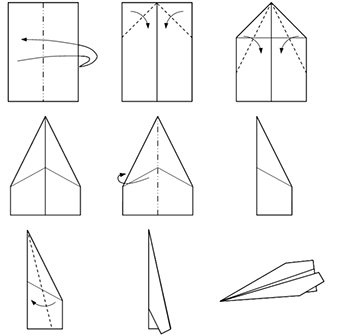 u are going to fold a rectangular piece of paper to keep the plane aloft as long as possible. What type of form do you think works the best for this situation? Hint: Try a boxier, trapezoidal shape with lots of wing area. Make five tests. Make a chart and record the shape and record the time afloat! Check the Guinness World Record for longest flying paper airplanes. How close did you get? This challenge is to make a plane that flies the longest distance. Now that you have trued a sleek, speedy flier and a big wing span duration flier, it is time to try for the longest distance. 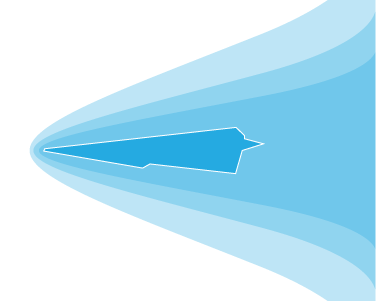 This folded paper plane will probably be larger in size than the speedy flier, but have less of a wing area than the duration flier. Make three different folded paper trials. Fly them all each time. Average their distances together. Which plane shape proved the most successful? For your final flier, it is time to make a landing strip if you have yet to make one. Just like in airports today, start your landing strips with a series of striped lines that show low flying pilots where the strip begins. Make sure to put s center stripe down the middle to keep the plane on course! Now attempt to build a flier that can not only hold flight, but also descend in gentle manner and be easily directed! 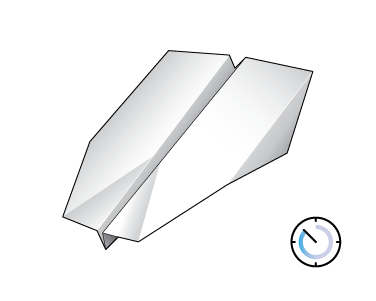 This folded paper will be a new combination with a precision nose, a fuller wing span to go the distance, and a back bed to help with the accuracy of the descent. Do a little research on paper airplanes shapes and sizes and purposes. Fold Away. 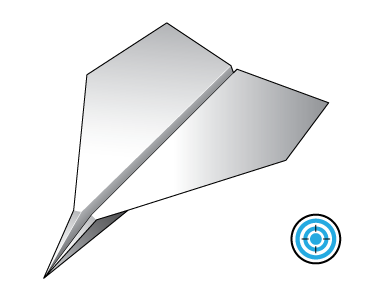 Become a Paper Airplane Ace! Which force is responsible for moving the plane into the air? Which forces pull the plane back to the ground? A paper airplane needs an air current to continue to stay afloat. A long distance flyer usually has less of a __________area than a duration flyer. One Thousand Means of Escape!